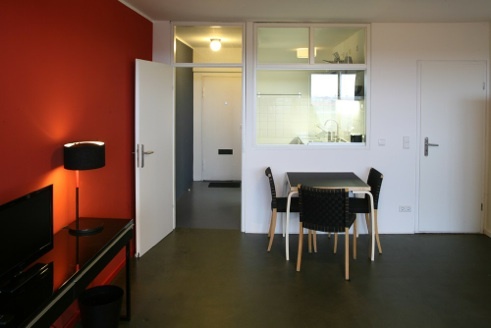 An apartment in Le Corbusier’s Unité d’habitation in Berlin, built 1958, was renovated and restored to nearly its original condition. 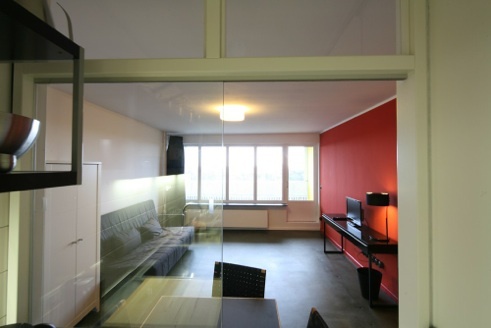 The owner, a Berlin based editor of an architectural magazine, offers the furnished apartment for rent. 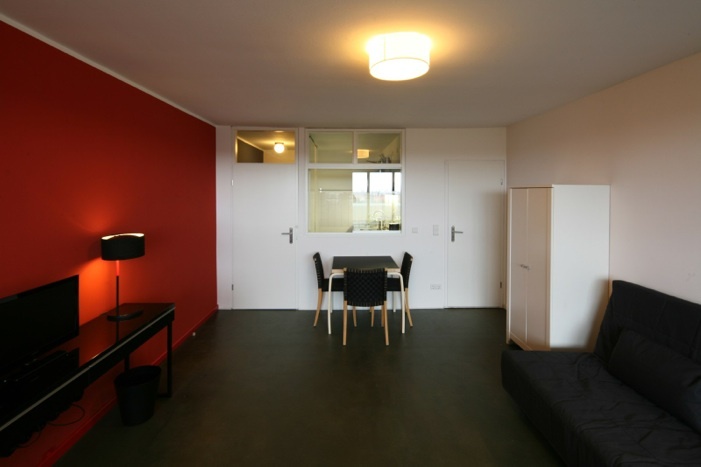 Enjoy the panoramic view of Berlin’s city and be part of the community in the famous „Corbusier house“. 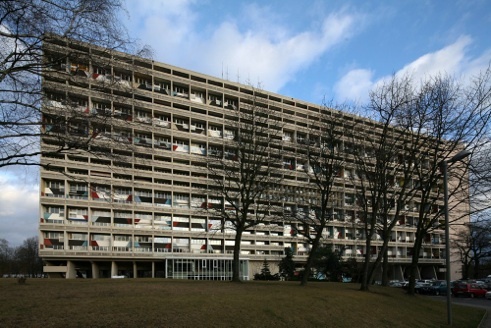 Contact us here: visitors@corbusier-berlin.de. In 2011/12 the apartment has been led back to the intentions of the construction time. We removed later changes and rebuilt the wall between kitchen and living room. The interior color scheme is inspired by Le Corbusier's color theory, which was implemented at the exterior of the house. The renovation has been planned and monitored by architect Kathrin Bunte (Berlin). All apartments in the Corbusier house were originally equipped with glass windows between kitchen and living room. 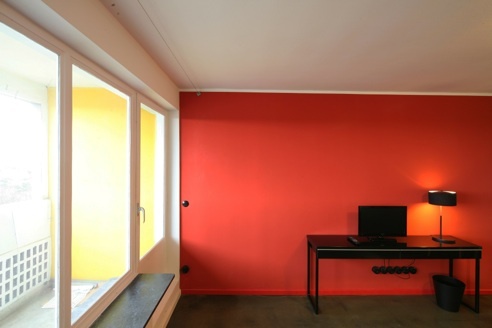 We reconstructed a window to show the spatial ideas of Le Corbusier even in the one storey apartments. In 1958, neither hamburgers nor döner were the synonym for fast food, but shashlik. So the Berliners popularly called this "shashlik window", based on the windows of the mobile trailers that were used to sell food. Under a modern PVC flooring we discovered the original linoleum. This shows traces of fifty years of use and has been worked up. The new linoleum floor in hall and kitchen was sponsored by the manufacturer Armstrong DLW AG. 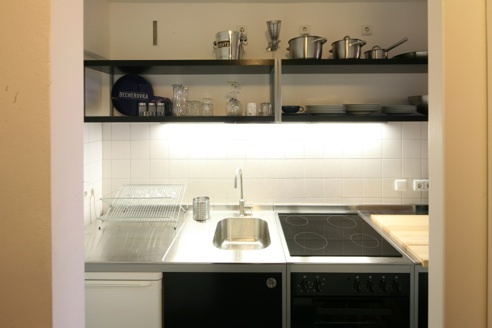 The rent is 790 € for a month and includes everything except telephone/internet charges. Minimum stay: 2 months. Please note: We are neither a hotel nor a holiday apartment. We do not offer hotel services like room service or cleaning. The 33-square-meter apartment has a fully equipped kitchen with oven and ceran field, a balcony and a bathroom with toilet and shower. The apartment hosts up to 2 adults. Parking in front of the house is free. A rail service (S-Bahn) with 10-minute intervals connects the house within 12 minutes to downtown (Zoologischer Garten). In urgent cases please call our mobile phone: +49 172 3943217.